Easy Fried Rice + Video - Restaurant Style Fried Rice in Minutes! Easy Fried Rice Recipe – Restaurant Style Fried Rice! Easy Fried Rice is an essential recipe for any home cook. Although it is very simple in theory, many folks have trouble getting the restaurant style rice they crave. 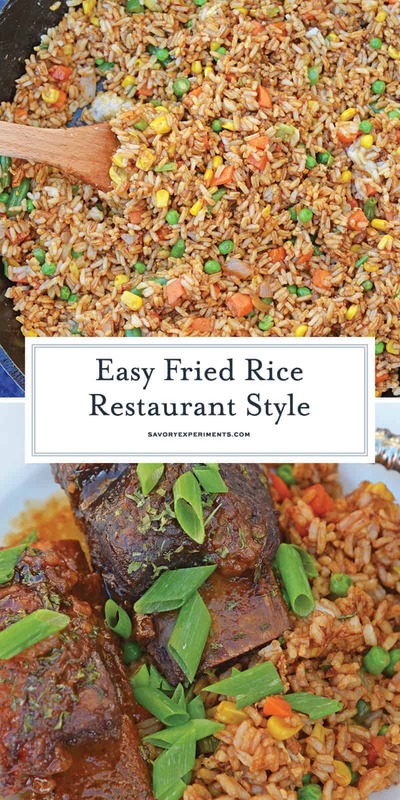 Easy Fried Rice is the best restaurant style fried rice you’ll ever make! Just 15 minutes and a great way to clean out the vegetable drawer. There are a few tricks to getting the perfect fried rice every time and I am going to share them with you. That is why you are here, right? To figure out who to get the perfect restaurant fried rice at home? The first, and what I think is the most critical to getting perfect fried rice: COLD RICE! Many say it needs to be day-old rice, but I find that making it the same day and chilling it works just the same. If you have leftover rice, you can use that. A medium-grain rice tends to work best. I prefer to use Jasmine rice (sticky rice), but this batch was actually made with instant white rice and turned out just as delightful. 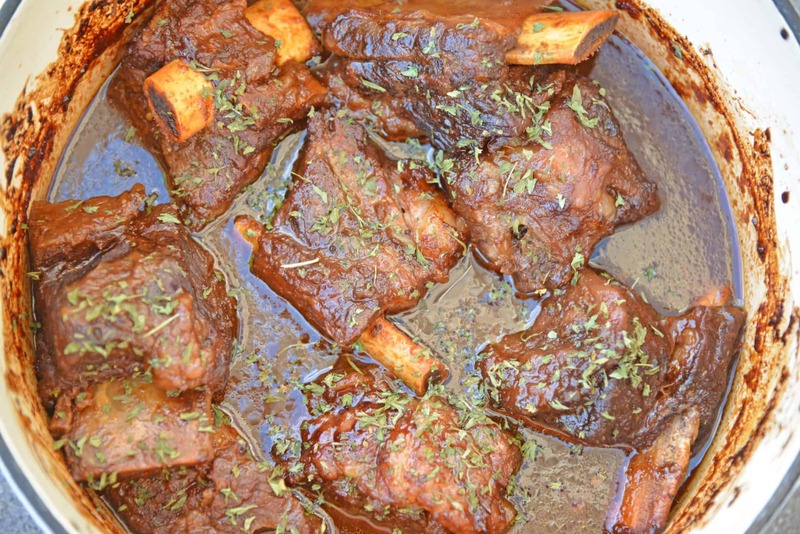 I paired it with my Honey Ginger Short Ribs– so tasty! These rice grains will be their own, perfect little pellet and not turn to mush. The dehydration will allow some of the other flavors to absorb. So what is my trick if I am making fried rice the same day? I cook the rice according to the package and then I spread it out in a thin layer on a large rimmed baking sheet. I place this is the refrigerator, or even sometimes the freezer, to speed the process up. Give yourself at least an hour to get a good chill. It still requires some thinking ahead, but not nearly as much as a day! Next is the soy sauce. Not all soy sauce is created equal. This became really apparent to me after a recent trip to Japan when none of the soy sauces were recognizable. They were less salty and thick, nearly syrupy. But the flavor, oh my goodness.
. Flavorful, it is perfect for adding acid to soups, sauces, salad dressing and of course, Easy Fried Rice! Whichever soy sauce you use, make sure to taste it first and adjust the amount based on saltiness and flavor. Start small knowing you can always add more, but you can never take away. 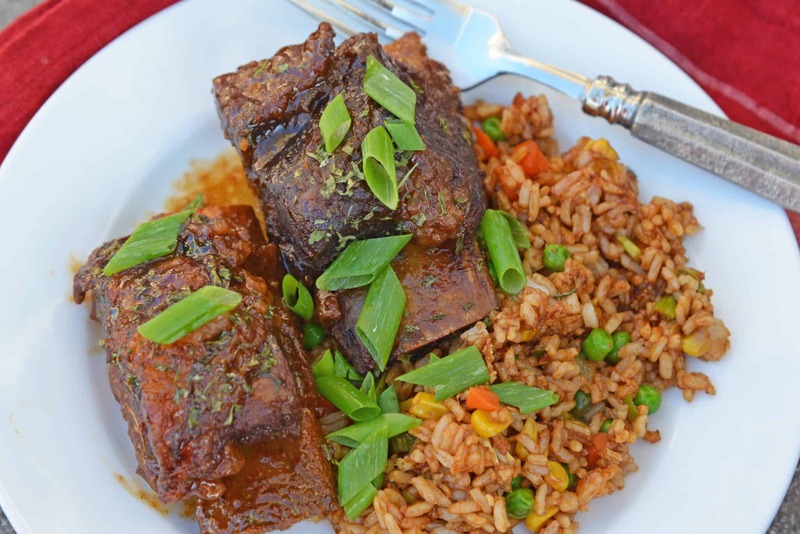 For a little switch up, you can also use a Teriyaki Sauce for a sweet Fried Rice. Only add 1-2 tablespoons. 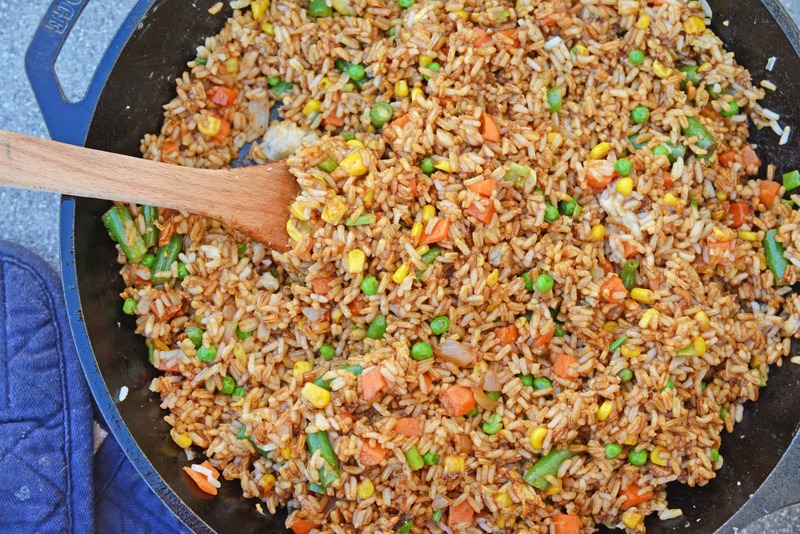 Easy Fried Rice is not only a great recipe for using up leftover rice, but also to use up odds and ends of vegetables. One veggie I always use in my fried rice recipe is onion. However, the type depends on what I have on hand and it commonly a mixture of several, adding even more sophisticated flavor. Red, leek, scallion, shallots, white, yellow, chives, they will all work! Similarly, use whatever other vegetables you have on hand. Bell peppers, carrots, peas, green beans, broccoli, zucchini, corn, really just about anything! If you are using diced and raw, add it with the onions and saute to soften. I also use frozen vegetables, because I always have those in my freezer. A six ounce bag of mixed veggies does the trick for me! Many claim you need a wok to distribute the heat evenly. Nope, you don’t. In fact, depending on what type of stove you have, using a wok could prevent the heat from distributing! I actually prefer my handy cast iron skillet. And lastly, if you want to add a protein to make Easy Fried Rice into your entree, be my guest! Cook it ahead of time and add it at the very end. 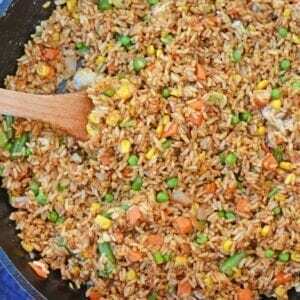 Seafood, especially shrimp, beef, pork and chicken seem to be the most popular types of fried rice. If you want the restaurant style red pork, look for Chinese Sausage in the meat case. – You’ll love this stuff, I promise! – a workhorse in the kitchen, you won’t believe how much you use it for! – One thing you’ll have to get used to is that the handle gets hot. A slip on silicone cover will prevent painful burns. Rimmed Baking Sheet – Really, every kitchen should have one (or three! ), but here you’ll use yours for cooling the rice. 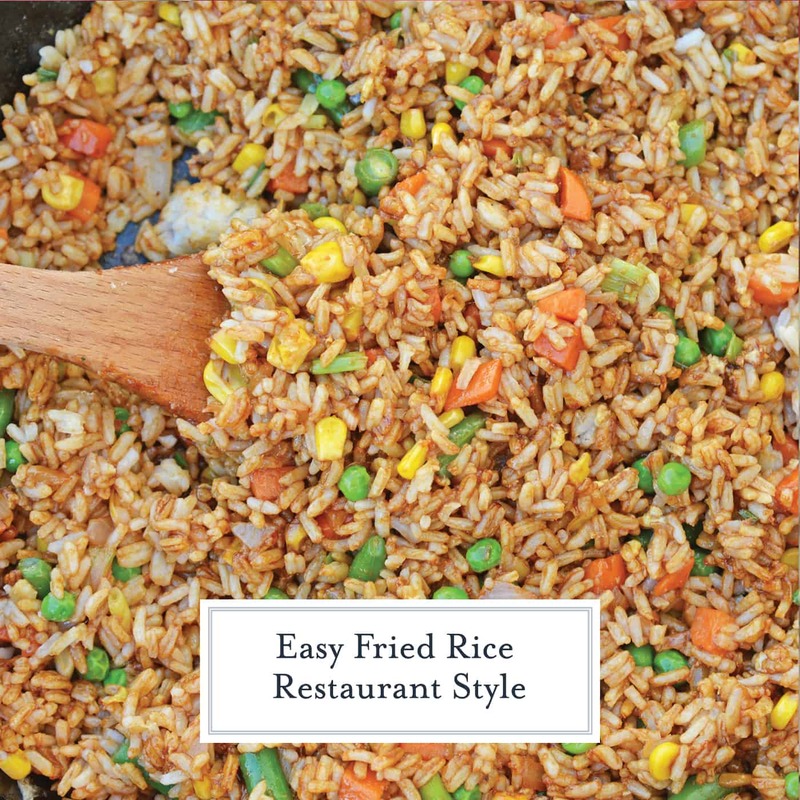 Easy Fried Rice is the best restaurant style fried rice you'll ever make! 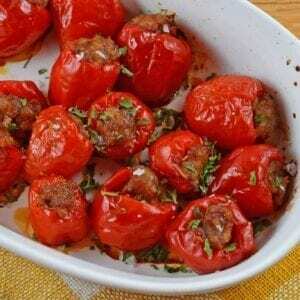 Just 15 minutes and a great way to clean out the vegetable drawer. In a small bowl, whisk together sesame oil, soy sauce of choice and white pepper. Set aside. 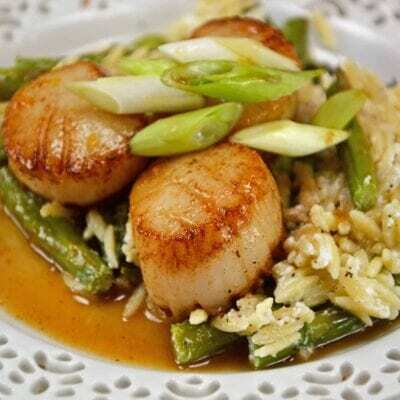 In a large skillet, cast iron pan or wok, heat vegetable oil over medium-high heat. Add onions and saute until opaque and soft. If you are adding raw vegetables or a cooked protien, add them at this step as well. After onion has cooked, add frozen vegetables. Stir until defrosted, approximately 3-4 minutes. Add cold rice, using a spatula to toss the rice with other ingredients. Do NOT stir, toss or flip to prevent the starch from making the rice too soggy. 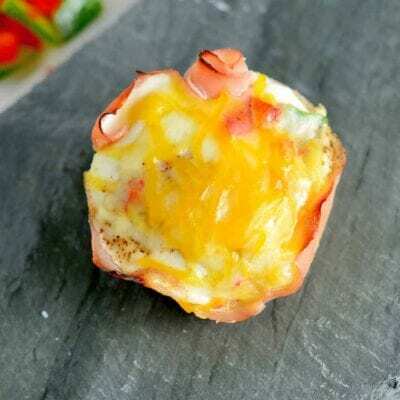 Add lightly beaten eggs, continuing to flip until eggs are nearly cooked. Pour sesame oil mixture over top of rice, continuing to flip and toss until all grains are uniformly colored. If you do not use a dark soy sauce, yours might not be as dark as mine. I made this tonight. It was delicious . My husband ate 2 huge bowls so there wasn’t much left. Yay! Love to hear that, thank you for stopping by to let us know, Penni! Your video leaves a lot to be desired. It went from adding the rice to the veggies and then to the serving dish. What happened to the oil/soy mixture? The insistence of DO NOT stir, toss or flip. Not of that was shown in the video and it would seem that it would have been an important part of the procedure. Sorry you don’t like the video, hopefully you’ll like the recipe better. The recipe has evolved a lot since we originally made the video. Can’t wait to have this for dinner! Thanks so much for letting me know I can use my cast iron, I don’t have a wok and use my cast iron for everything so that helps a lot! 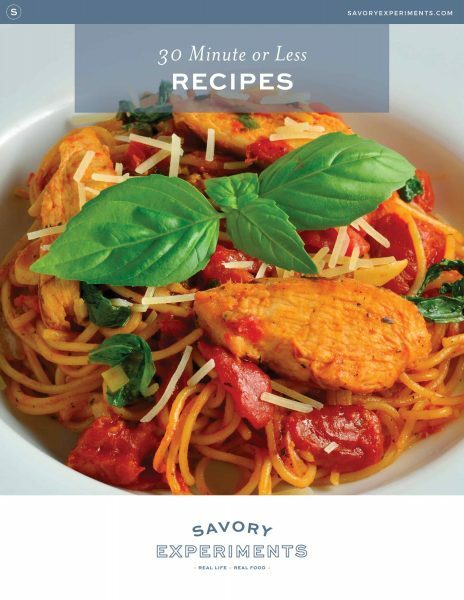 I made this Tuesday night for dinner and it was so good I’m making it again this weekend. Thanks for the recipe. That is what I like to hear! Thanks for stopping by to let us know. 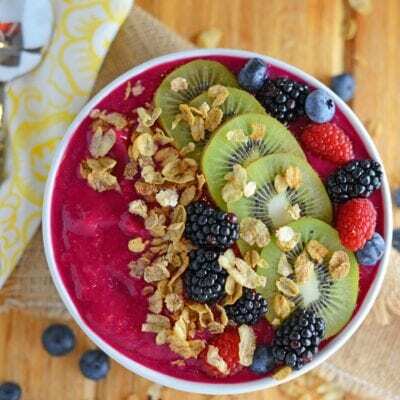 Found this on Yummly – very good, I made without eggs or any protein but was still delicious and very simple to make. 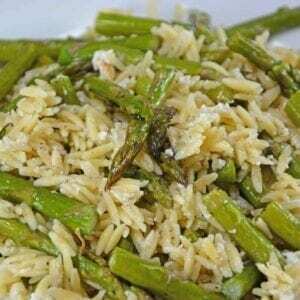 I didn’t wait until my rice was cold before I started to make this recipe and was still great! I also substituted black pepper for the white pepper. I’m so glad you made the time to come back and let me know! It makes me heart happy. Happy holidays! 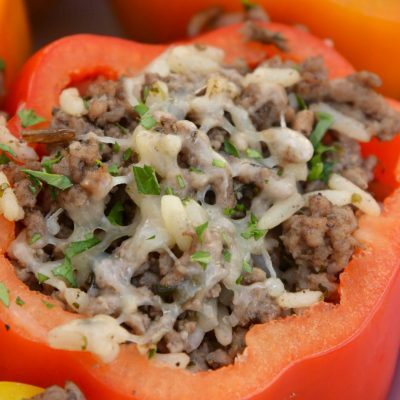 What a great use of leftover rice! Will have to try it. I love fried rice and this look delicious!! I’m going to have to make this for my mom. Fried rice is her favorite. I have tried so many fried rice recipes and never like them! Can’t wait to try this!